A short note here mainly to call to the reader’s attention a fascinating “trialogue” on the C2 molecule.1 Shaik, Danovich, Wu, Su, Rzepa, and Hiberty2 recently presented a full CI study of C2 and concluded that the molecule contains a quadruple bond (see my previous post on this paper). This work was inspired in part by a blog post by Henry Rzepa. The trialogue1 is a conversation between Sason Shaik, Henry Rzepa and Roald Hoffmann about the nature of C2, its 4th bond, its diradical character, and some historical detours to see how some of our theoretical chemistry ancestors came close to proposing a quadruple bond. The discussion weaves together simple MO pictures, simple VB models, and the need for much more sophisticated analysis to ultimately approach the truth. Very much worth pointing out is the careful analysis of trying to tease out bond dissociation energies, especially analyzing the assumptions made here – including the possibility of errors in the experiments and not just errors in the computations! This is a very enjoyable read, following these three theoreticians as they traipse about the complex C2 landscape! (1) Shaik, S.; Rzepa, H. S.; Hoffmann, R. "One Molecule, Two Atoms, Three Views, Four Bonds?," Angew. Chem. Int. Ed. 2013, 52, 3020-3033, DOI: 10.1002/anie.201208206. (2) Shaik, S.; Danovich, D.; Wu, W.; Su, P.; Rzepa, H. S.; Hiberty, P. C. "Quadruple bonding in C2 and analogous eight-valence electron species," Nat. Chem. 2012, 4, 195-200, DOI: 10.1038/nchem.1263. Truhlar has made a comparison of binding energies and relative energies of five (H2O)16 clusters.1 While technically not organic chemistry, this paper is of interest to the readership of this blog as it compares a very large collection of density functionals on a problem that involves extensive hydrogen bonding, a problem of interest to computational organic chemists. 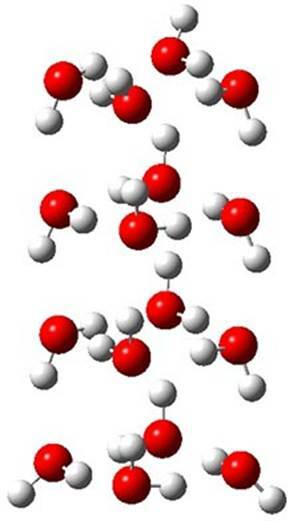 The CCSD(T)/aug-cc-pVTZ//MP2/aug-cc-pVTZ energies of clusters 1-5 (shown in Figure 1) were obtained by Yoo.2 These clusters are notable not just for their size but also that they involve multiple water molecules involved in four hydrogen bonds. Truhlar has used these geometries to compute the energies using 73 different density functionals with the jun-cc-pVTZ basis set (see this post for a definition of the ‘jun’ basis sets). 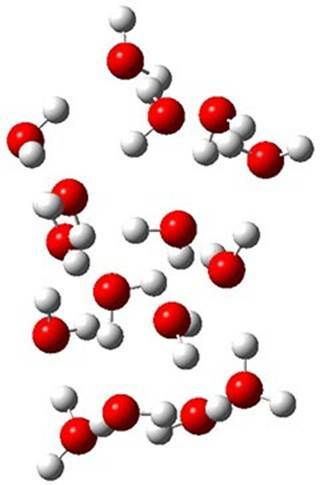 Binding energies (relative to 16 isolated water molecules) were computed along with the 10 relative energies amongst the 5 different clusters. Combining the results of both types of energies, Truhlar finds that the best overall performance relative to CCSD(T) is obtained with ωB97X-D, a hybrid GGA method with a dispersion correction. The next two best performing functionals are LC-ωPBE-D3 and M05-2x. The best non-hybrid performance is with revPBE-D3 and B97-D. While this study can help guide selection of a functional, two words of caution. 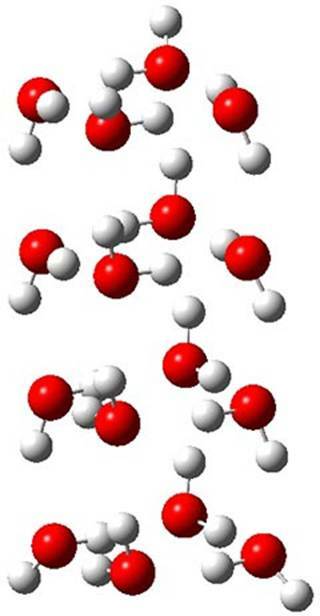 First, Truhlar notes that the best performing methods for the five (H2O)16 clusters do not do a particularly great job in getting the binding and relative energies of water hexamers, suggesting that no single functional really stands out as best. Second, a better study would also involve geometry optimization using that particular functional. Since this was not done, one can garner little here about what method might be best for use in a typical study where a geometry optimization must also be carried out. 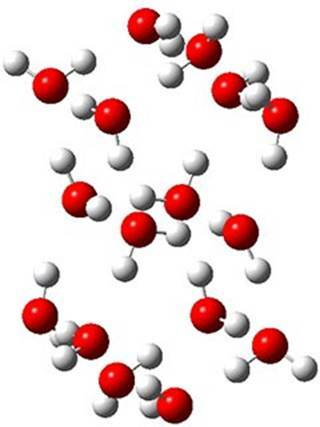 Functional and Semiempirical Wave Function Methods for Water Nanoparticles: Comparing Binding and Relative Energies of (H2O)16 and (H2O)17 to CCSD(T) Results," J. Chem. Theor. Comput. 2013, ASAP, DOI: 10.1021/ct300848z. 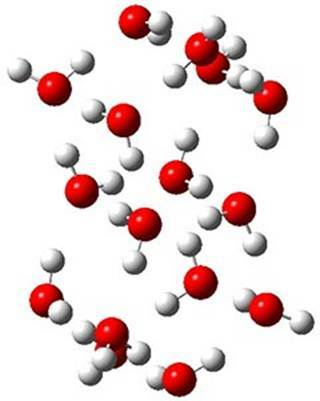 (2) Yoo, S.; Aprà, E.; Zeng, X. C.; Xantheas, S. S. "High-Level Ab Initio Electronic Structure Calculations of Water Clusters (H2O)16 and (H2O)17: A New Global Minimum for (H2O)16," J. Phys. Chem. Lett. 2010, 1, 3122-3127, DOI: 10.1021/jz101245s. I have discussed a few bowl-shaped aromatics in this blog (see for example this and this). 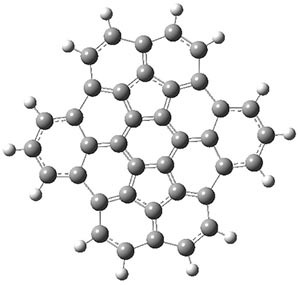 Kuo and Wu now report on a few bowls derived from C70-fullerenes.1 The bowl 1 was synthesized (along with a couple of other derivatives) and its x-ray structure obtained. 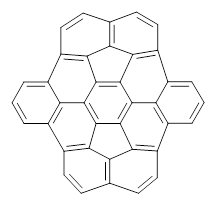 As anticipated this polyclic aromatic is not planar, but rather a definite bowl, with a bowl depth of 2.28 Å. 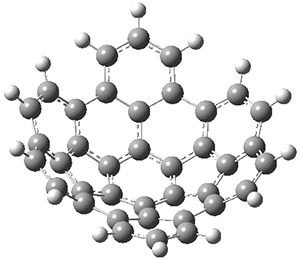 This is less curved than when the fragment is present in C70-fullerene. Interestingly, this bowl does not invert through a planar transition state. The fully planar structure 1pl, shown in Figure 1, is 116 kcal mol-1 above the ground state bowl structure, computed at B3LYP/cc-pVDZ. Rather, the molecule inverts through a twisted S-shaped structure 1TS, also shown in Figure 1. The activation barrier through 1TS is 80 kcal mol-1. This suggests that 1 is static at room temperature, unlike corranulene which has an inversion barrier, through a planar transition state, of only 11 kcal mol-1. The much more concave structure of 1 than corranulene leads to the greatly increased strain in its all-planar TS. This implies that properly substituted analogues of 1 will be chiral and configurationally stable. Not remarked upon is that the inversion pathway, which will interchange enantiomers when 1 is properly substituted, follows a fully chiral path, as discussed in this post. Figure 1. B3LYP/cc-pVDZ optimized geometries of 1, 1TS, and 1pl. (1) Wu, T.-C.; Chen, M.-K.; Lee, Y.-W.; Kuo, M.-Y. ; Wu, Y.-T. "Bowl-Shaped Fragments of C70 or Higher Fullerenes: Synthesis, Structural Analysis, and Inversion Dynamics," Angew. Chem. Int. Ed. 2013, 52, 1289-1293, DOI: 10.1002/anie.201208200.